Lend $25 on Kiva for FREE! 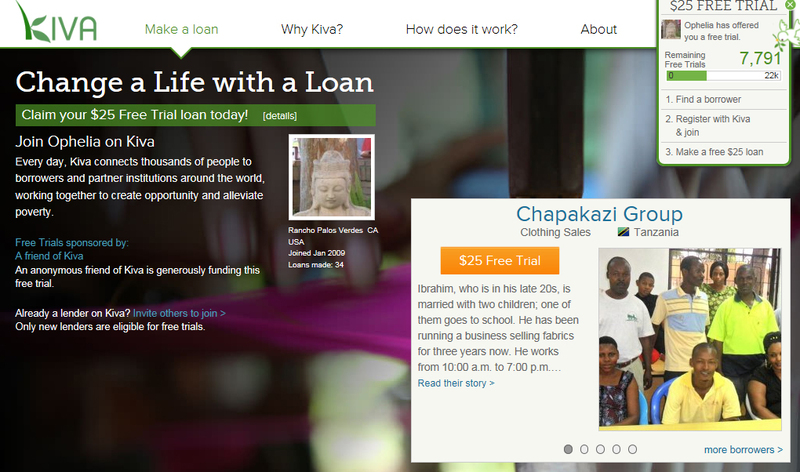 Are you a Kiva lender yet? NO? Then this is your lucky day. Kiva is an organization that aims to combat poverty by enabling people to help themselves. Kiva lenders are ordinary people like you and me who make small loans to borrowers around the worlds to give them that small boost to get them over whatever hump life may have decided to throw their way. You can choose from a list of borrowers on the website who you would like to extend the loan to. No matter where or who you choose, you will be making a difference in someone’s life and the best thing about it is, you can do it over and over again! If you sign up now as a new lender, you can give out a loan for $25 just to try out how it all works. This matching initiative is from other Kiva lenders who have experienced how satisfying and rewarding it is to help someone else get a leg up. Check out Kiva now and join for Free!